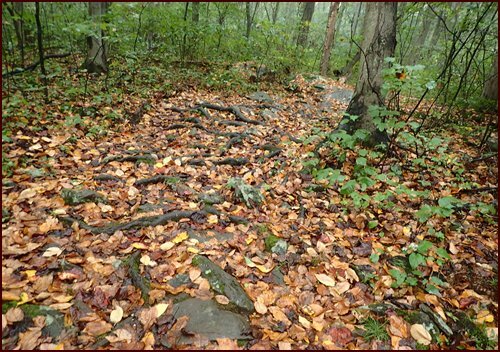 In the last issue of Trail Bytes, I detailed how I dried food for an eight-day, late September hike on the Appalachian Trail in Northern Virginia and West Virginia. In this issue I look back at the hike, which ended up taking only seven days to complete. Starting from Elkwallow Wayside inside Shenandoah National Park, fifteen miles from the northern boundary, I hiked seventy-three miles to Harpers Ferry, West Virginia. Elkwallow Wayside is where Dominique and I ended our backpacking trip a day early in the spring due to freezing weather. 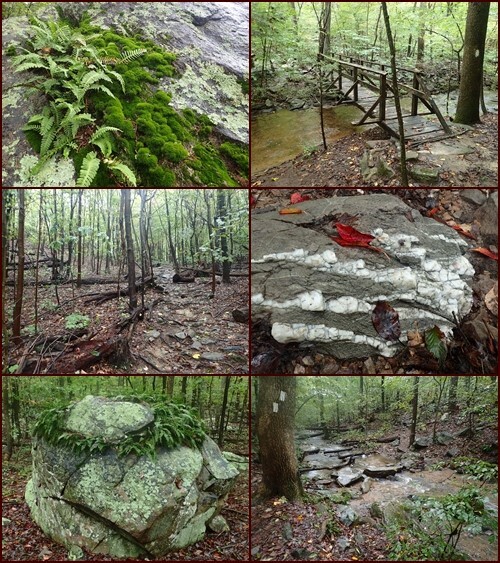 Virginia has watered me thoroughly each time I have hiked there, and this trip was no exception. Seven days weather went like this: fog, sunshine, heavy mist, rain, rain, mist and rain, fog and late sunshine. I expect the Appalachian Trail to challenge me, to throw up obstacles. It makes the steak at journey’s end more savory. I have learned to sing in the rain, and singing helps when hiking in the dark, too. Here are the highlights of the first five days. And just for a change of pace, I present it in present tense, rather than past tense. I will send a second newsletter soon with details about the last two days. After the shuttle from Harpers Ferry to Shenandoah National Park in the morning, I hike just under six miles the first day. 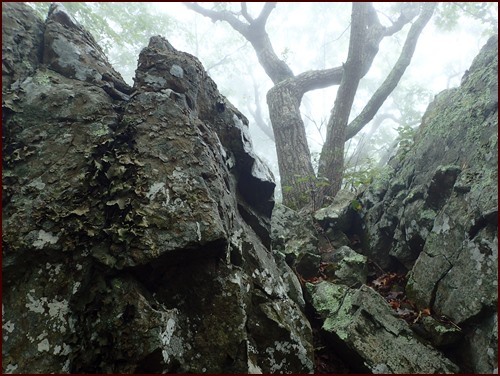 Views from Shenandoah’s scenic overlooks are shrouded by fog. I eat chili for lunch, which I had prepared in the thermos in the morning using boiled water from the coffee maker at Lily Garden Bed & Breakfast. Fog inside the forest drifts ghost-like between trees and saturates green ferns. I walk though it reverently, stopping to look and listen. It is quiet. My skin is moist and cool. I am in a cloud with all nature around me. 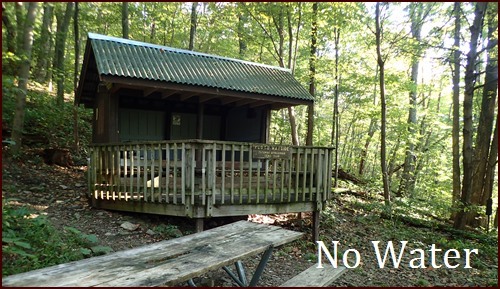 I spend the night at Gravel Springs Hut with two northbound section hikers and a southbound thru-hiker. Waker, the thru-hiker, is twenty-five years old, from upstate New York. After supper, he sews tears in his backpack and shoes with dental floss. Two more southbound thru-hikers set up a tent nearby. 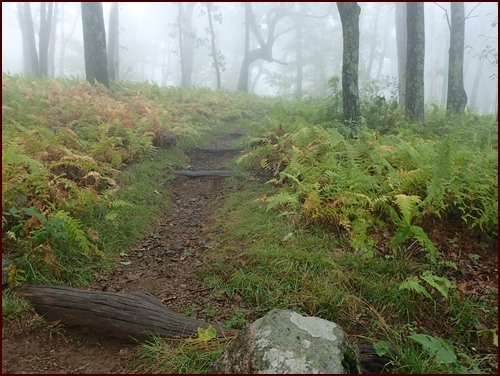 During the whole trip, I pass more than fifty thru-hikers heading south, and talk to most of them – which explains why I arrive at my destinations near dark every day. The sun appears on Day 2 with blue skies. 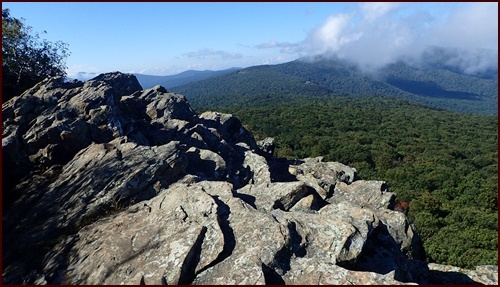 From rocky outcrops on Marshall Mountain, I look down over green canopy. Dozens of bluebirds fly over treetops in a line, fifty yards or so between each bird. Throughout the day, I see deer, squirrels, and chipmunks. Acorns are plentiful on the ground, but the full avalanche has not yet fallen. 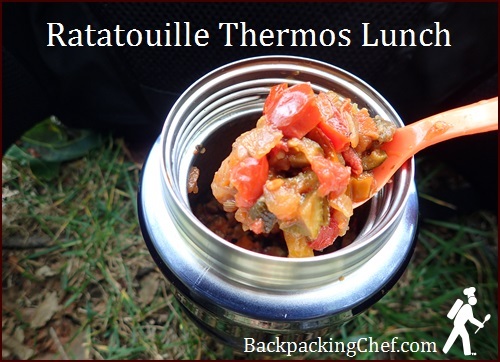 I eat a hot lunch of ratatouille along the trail, prepared with boiled water in the morning. 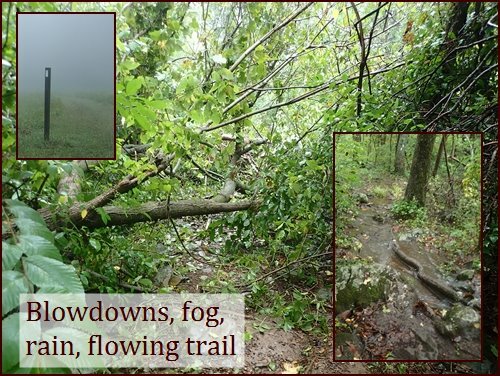 I reach Tom Floyd Shelter at sunset and walk down a steep side trail to the spring. I hear water trickling under a big rock; none flows out. With eight ounces of water on hand, I decide to hike three more miles to Mountain Home Cabbin in Front Royal. Amazingly, I have cell phone service at the shelter and confirm with Scott, the owner, that he has a bed for me. I know I will hike the last two miles in the dark. A night hike was not on the itinerary, but I am juiced nevertheless to hike in darkness at least once this trip. With a remnant of dusk remaining, I hike double-time. 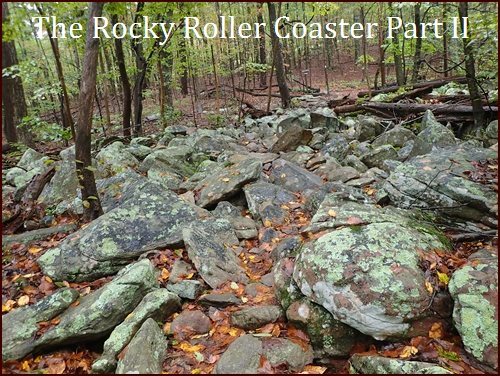 It is rocky, but my eyes adjust, scanning five-feet ahead, sharpening outlines of shadowy rocks. My brain tells my feet where to land in split-second decisions. I turn on my headlamp for the last mile. Rounding boulders in the dark, I am more bear-aware. I sing, whistle, and slap my hiking poles together. Near US 522, I walk beside a high, chain link fence topped with barbed wire. 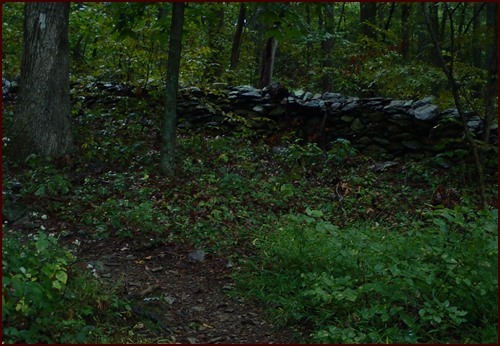 It is the boundary of the Smithsonian Conservation Biology Institute. Behind the fence, on a thousand acres, endangered species are raised and studied, including rare birds, wolves, leopards, and cheetahs. Here and there, fallen trees lay across and flatten the fence. The hostel is fifty yards up US 522 from the trail. There are two women and a man talking at the kitchen table. The man is Jim, who I bunked with the previous night at Gravel Springs Hut. Scott, the owner hands me a glass of lemonade. After sharing the last piece of my pizza with Jim, we all retire to the tidy sleeping area upstairs. After showering, I wash my shirt, socks, and underwear in the sink and they are nearly dry in the morning. Scott cooks breakfast for us including eggs, bacon, and pancakes. 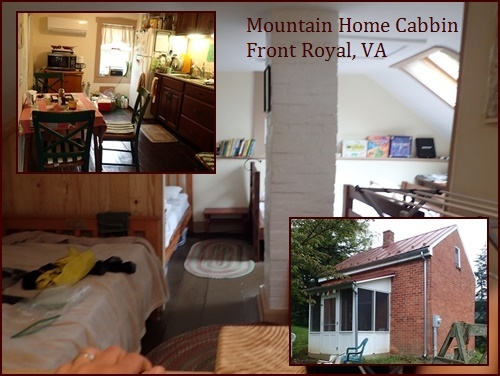 I highly recommend stopping at Mountain Home Cabbin in Front Royal. Moisture on Day 3 makes rocks and roots slippery. I arrive at Jim & Molly Denton Shelter at 1:30 and eat saffron risotto with chicken which I had prepared in the thermos in the morning. 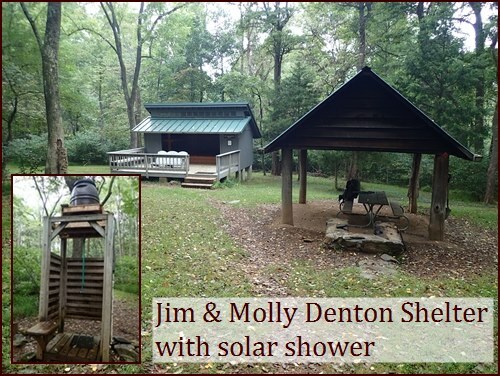 The shelter has a front deck with Adirondack chairs and solar shower nearby. 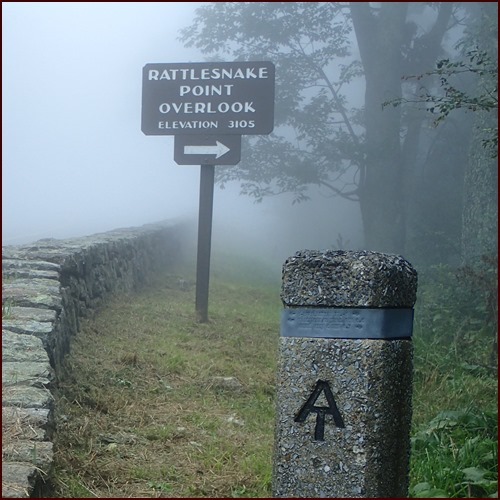 This is my planned stopping point for the day, but with the ever-present dampness, I decide to hike on to Manassas Gap Shelter rather than sit all afternoon. I hold my umbrella in one hand and a hiking pole in the other. Late in the afternoon, I hang the umbrella from a vine and stand under it to eat rehydrated fruit cocktail from my thermos. Deciduous trees along the trail are huge; it would take two or three people joining hands to reach around the trunks. The understory is thick with saplings waiting their turn. Rock walls evoke thoughts of former inhabitants. Confederate troops had assembled in this area under Col. Mosby. I walk slowly and dusk catches me as I arrive at the next shelter. Jim is already settled in at Manassas Gap Shelter. A smoky-voiced woman is here also. She has been day hiking and providing support for her daughter and three friends who are thru-hiking. They arrive two hours later in heavy rain. 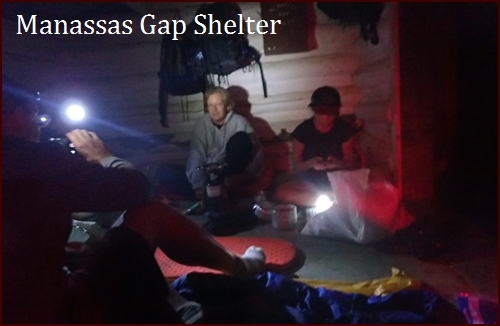 The six-person shelter fills with body odor and stink-saturated, wet gear. I actually enjoy the smell of their cigarettes. Not hungry enough to eat supper after a big lunch and late afternoon fruit cocktail, I snack on sweet potato bark, pumpkin pie bark, and applesauce leather instead. It rains all night; I muffle the pinging sound on the tin roof with earplugs. It is raining in the morning when I leave. 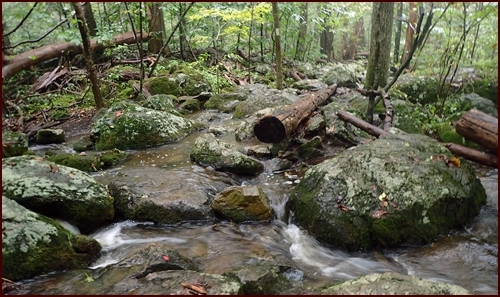 On Day 4, the trail crosses several streams which are swollen from rain. I pass through fields at Sky Meadows State Park in driving mist that nearly turns my umbrella inside out. The trail runs like a river in many places. Trees have fallen across the trail, pulling vines down with them. I climb over branch and vine entanglements, and walk widely around other toppled trees. I stop at 2 PM and eat crab chowder from the thermos, chatting with other backpackers as they pass me on the trail. Once again, Jim beats me to the shelter. We're not racing. I just stop a lot to talk to people and to take photos. 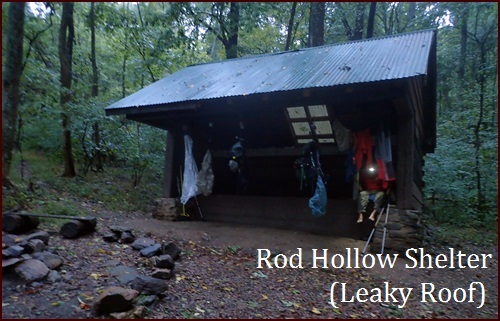 After cooking chili mac for supper, I sleep on the top platform of Rod Hollow Shelter and Jim sleeps below. The shelter is damp inside, presumably from the drifting mist. I roll out a sheet of Tyvek under my sleeping pad. It rains all night. The roof leaks. In the morning we have puddles next to our sleeping bags. … And rocks, rocks, rocks. They are slippery. There is sand, too – heaved up from an extinct ocean eons ago. The soles of my trail-running shoes do not grip well, but otherwise, the mesh-fabric shoes are comfortable, and water exits them as fast as it enters. Twice my feet slide out from under me, but I avoid falling. I arrive at Bears Den Hostel at sundown and claim the last bed. 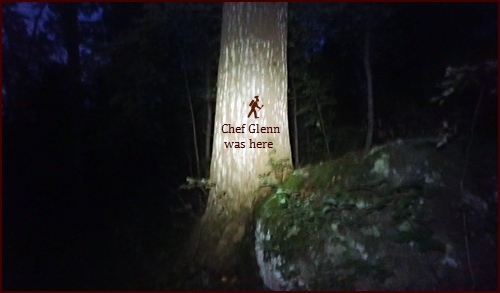 I’ll pick up from here in a follow-up newsletter covering the last two days of the hike, impressions of Harpers Ferry, and more about the food. Thanks for reading.